I avoided double buffering to save precious RAM for audio purposes, thus some limitations in my object. As my object allows to draw the content of an oscillo scope object, it may be easy to make an object compatible with a scope object to draw other curves, such as envelopes. 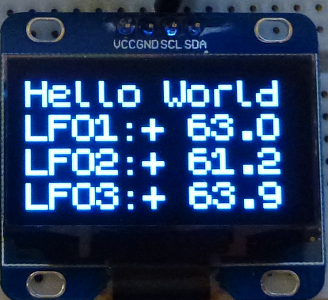 If you want to use two displays, verify that you can change their I2C address (generaly with some strap or soldering desoldering a 0 Ohm resistor). On Axoloti I dont really need the graphics so I can do with the simple version and save ram for other puposes. clkDiv is the clock divider, 6 is 48kHz/6 i.e. 8kHz. Now, let's experiment and share some 8bit formulas ! Thanks @lokki, I missed this one ! it really looks great and includes some presets ! This is a very special kind of distortion that generate lots of harmonics. It is roughly x8 oversampled to limit aliasing. The help patch uses a simple sine wave as an input.. but the output is somewhat more "powerful". Just want to give a huge thumbs up from here @SmashedTransistors. Your objects are really cool and for a beginner coder like me, I learned a lot from looking at some of your objects. I plan to take a "break" to add some comments in the patches and in the objects code. The distortions themselves are static functions (for a given input value, they will always give you the same output value). The fractal distortions in the examples seem to be modulated because their inputs are modulated. In fractal I.axh It is an amplitude modulation by an ADSR envelope. You can change the ADSR settings to change how the distortion evolve and add and ADSR andVCA after the distortion to have separate distortion/volume envelopes. In fractal I_multiSin the modulation is caused by the slight detuning of the oscillators apart from exact harmonics, you can change the detuning settings of the detHzLH objects to tweak the evolution rate. In fractal II.axh The modulation is caused by an input offset, you can change the rate by tweaking the LFO rate. (I used MIDscopes from @SirSickSik so that it is easy to visualise why I call those "Fractal" ). In fractal III fat.axh I use detuning and an irregular modulation of a high harmonic to get some sort of old school effect. I have improved the oversampling algorithm so that it uses a triangle window (instead of raw "box window"). haha, thanks for the clarification. i was obviously a bit in a hurry when i wrote this. by looking at the help patches it is obvious that the "modulation" is external. great! I actually got a simple VST written the other day, using Juce. But I let it go because I spendt more time on GUIs than on DSPs. I guess that things has evolved since then. well, that is/was a GREAT GUI!!! Yeah thats a really cool GUI. Yeah today things are much easier. Juce handles a lot of the stuff that make the process of making a plug in very long. it handles the framework, libraries etc. Even the GUI, you can use some bundled knobs faders etc.. I did try a few times but when I actually got it working it only took me like a couple of hours getting it working. And Juce also offers a build in test system, so you can actually code in "real time" almost like using Axolotis editor, but just with VST's Its pretty cool .All though first one I did, I made it in Xcode. I need to get that set up, so I can do it "real time"
A lot of the big vendors use it too. I think Eventide makes the UI in Juce and a also Slate Digital for example. So its definately "professional standard".